Maybe I’ve even said something along those lines. I love Brian so much. I can’t even try to put that love into words. My heart honestly expands against my chest when I think about how much this little boy and his brother mean to me. They are my world. They are my sunshine. They are my heart and soul. They are my everything. But I’d be lying through my teeth if I said I wouldn’t change a thing. If I got my hands on a magic wand you better believe the first thing I’d wave it at would be autism. It wouldn’t even take a moment of thought. No hesitation at all. I’d do it for selfish reasons- more sleep, no more cleaning up poop, my finances would be in a better order, more time to myself, less anxiety for myself. I’d do it for Corbin. He wouldn’t have to have those feelings that he is second-best behind some diagnosis he still can’t pronounce correctly. He wouldn’t have to worry about his little brother and be braver than his years to stick up for him. He would have a real playmate. Mostly I’d do it for Brian. I’d do it for his past, his present, and his future. I would want to take away all the pain- the physical affliction, the mental anguish, and the emotional pain. I’d do it so he could talk and tell me where it hurts, what he wants, and what his dreams are. I’d do it so he could make connections and wouldn’t feel so alone in this world. I’d do it so people would accept him and understand him and start looking at who he really is, not just what his diagnosis is. I’ve noticed there is a big divide in the autism community between those who say we need to raise awareness and those who say we need to raise acceptance. I don’t see why we can’t have both? I don’t see why I can’t say I would wave that magic wand to rid my son of autism and still be a mom that accepts her son, autism and all. Because I do, I accept him and cherish him and love him to pieces. Today marks the beginning of Autism Awareness Month. I don’t have that magic wand, but I do have the power to advocate so his, and thousands more, future will be brighter. 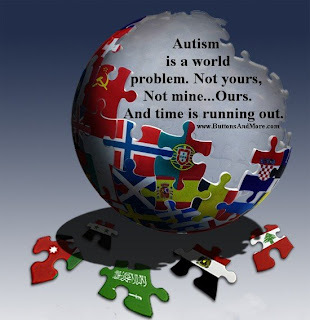 No matter what camp you are in- biomedical, ABA, vaccinate, don’t vaccinate, etc., etc.,- we all need to unite and realize we are all working on the same thing- a brighter future for our children with autism. A united voice will be so much louder than a bunch of different, fragmented ones. Happy (?) Autism Awareness Month! !